Swine flu fears crippled the government's national flu website within minutes of it going live yesterday afternoon. The service was unable to cope with the initial demand from people visiting the site to assess their symptoms. The National Flu Service was launched to take the pressure off the NHS by offering sufferers access to drugs without the need to see a GP. 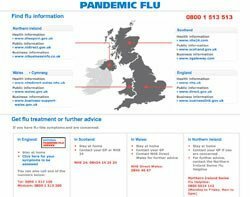 Swine flu sufferers can use the service to have symptoms assessed and obtain a code that can be used to get the Tamiflu anti-viral drug if necessary. In the first few hours, many users were unable to access the site and told to "try again later" because it was struggling to cope with the 2,600 requests a second. This is 9.3 million hits an hour, 5.3 million more than the four million the Department of Health (DoH) said the site was set up to handle, according to the Guardian. The DoH claims the site did not actually crash, but BT was forced to quadruple the capacity within two-and-a-half hours of launch to maintain the service. The service is also available by phone, but the swine flu hotline has not suffered the same problems as the web-based service, according to the Telegraph. The service is being run by more than 1,500 call centre workers capable of handling more than 200,000 calls a day, according to the DoH. The latest government figures indicate that 100,000 new cases of swine flu were reported in the past week, almost double the number for the previous week.